WASHINGTON (CNS) — Yoi Reyes believes that her son should not have to pay for a crime that was committed by another. Years ago as a teenager, Reyes was raped by her stepfather in her native Cuba. The first time, she was 13 and forced to have an abortion. The second time, the baby was too far along, and the doctor refused to do the abortion. Now her son, Pedro, is 27 and he welcomed his first child into the world on Thanksgiving Day. On Jan. 18, the day before the March for Life, Reyes joined more than 200 people outside of Planned Parenthood’s headquarters in Washington to show real-life examples of abortion. Priests for Life hosted the event. Priests for Life announced the same day that it filed an amicus brief in NIFLA vs. Becerra, a Supreme Court case that challenges a California law that would require some pregnancy resource centers to refer for abortions. The Reproductive “FACT” Act requires medical pregnancy resource centers to refer women for abortions and non-medical centers to advertise that they are not supervised by a medical professional. 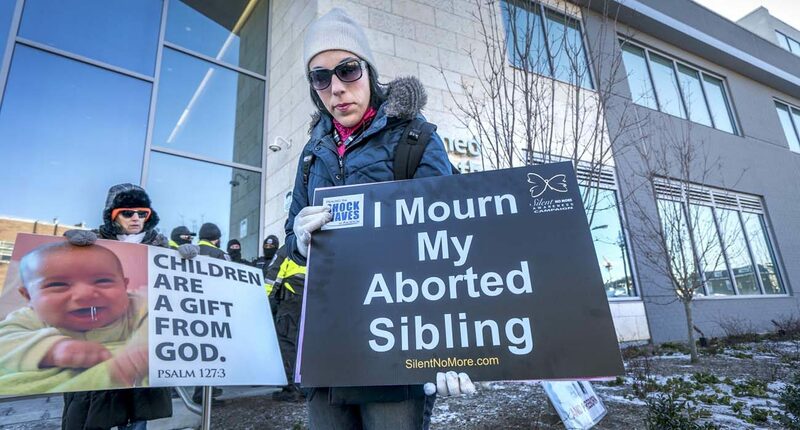 After several women shared their personal stories of abortion, Priests for Life executive director Janet Morana urged the crowd to take those stories home and share them in their communities. As she stood in front of Planned Parenthood in prayer, Savannah Madden watched the clinic escorts as they walked women inside. Earlier that morning, she saw a woman going into the clinic, who then changed her mind and turned around. Members of the LifeSquad team from Coalition for Life St. Louis also were among the crowd. The program provides outreach to high school and college-age youths, including through the 40 Days for Life campaign, to keep them involved in the pro-life movement throughout the year. As he handed out #LifeSquad stickers to the crowd, student outreach coordinator Brad Baumgarten noted that it’s imperative that young people are given an outlet at home to continue the energy they experience at the March for Life. Brinker is a staff writer at the St. Louis Review and Catholic St. Louis, publications of the Archdiocese of St. Louis.